Autumnwatch Tower is a pair of abandoned towers located south of Ivarstead. Before the dragons' return, the towers are occupied by a group of bandits. There are two bandits at the bottom of the northern tower, a bandit outside the southern tower and a bandit chief at the top. There is a dragon guarding the word wall, which teaches part of the Marked for Death dragon shout. The dragon will likely detect you before you ascend the towers, and can sometimes detect the undead of Arcwind Point and will fly off to deal with them. There is a silver ore vein located at the base of the southern tower. The dirt path leads to the southern tower and there is a stone path branching to the north that leads to the northern tower. Stairs lead up towards the north tower, past an old extinguished campfire, with a food sack and various items of clutter nearby. There is a non-respawning patch of imp stool on your right and a tanning rack just to the right outside the entrance. Another tanning rack is just inside the north tower, with a set of shelves to the right and a cooking pot in the middle of the first floor. The shelves hold two deer hides, two leather strips, and a blacksmith's elixir. Climbing the spiral stone stairs leads directly to the top floor, where three unowned bedrolls can be found. There is also an enchanted pair of hide boots and a hide helmet on a crate beside a straw bale. There is a copy of the Light Armor skill book Jornibret's Last Dance and a bottle of alto wine on the small crate by a chair. On the bottom floor of the southern tower are two imp stool fungus, several food sacks and barrels, a loose piece of firewood, and a woodcutter's axe on a wooden block. On the second floor is a bedroll, a random rare book, and a wooden bowl holding a chicken egg beside a bale of straw. On the other side of the bale is a food barrel with an apothecary's satchel on top. On the top floor, there is a skeleton that can be looted for a copy of Physicalities of Werewolves beside a crate with a bottle of Nord mead on top and an unlocked chest. In an open crate beside the skeleton are two bowls of vampire dust, and in another open crate on the other side of the chest are two samples of slaughterfish scales. There is a stone bridge crossing the gap to the word wall. A quicksilver ore vein is located 210 ft southwest of the tower. If you fall off the stone bridge to the word wall, there is a small point in the rocks where you may get trapped and be unable to escape from. Luckily you can still fast-travel from here. The dragon at Autumnwatch may be killed by undead south of the cliff overlooking Autumnwatch. 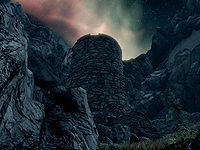 Autumnwatch Tower can be reached from Arcwind Point via a wall of dark, sloped rock on the road to Arcwind directly south of the Tower. Descending from this point lets you quite literally get the drop on the Autumnwatch dragon. The word may not appear on the wall, leaving you unable to learn the entire Marked for Death shout. There does not appear to be a definite fix for this, though loading from a previous save may cause the word to appear. You will hear the background music/chanting, and the sound that plays when you learn a word will play, but you will not learn the word. The chanting/background music will continue to play every time you visit the site. ?